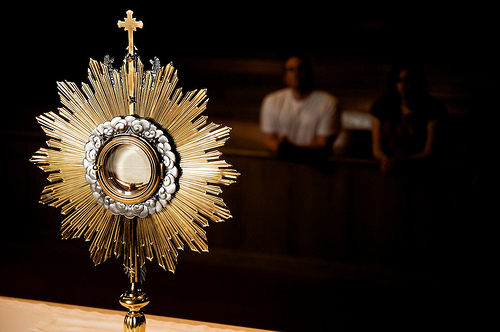 The Adoration Chapel is located near the nursery and is open each Monday noon until Tuesday noon for 24-hour dedicated adoration of Jesus in the Most Blessed Sacrament. In the chapel, members of the parish and community pray for the parish, diocese, community, and world at large. All members of the parish are encouraged to visit the chapel at least once a week and pray for their own intentions as well as the intentions of others. Each hour has a dedicated church member who ensures the Eucharist is never alone. If you are interested in signing up for a designated hour of worship, please the Parish office at (256) 353-2667 or parish@annunlord.com. Lord Jesus, as I kneel before Your hidden presence, help me respond to Your graces so that I may be as really present to You, as You are to me, in the most Blessed Sacrament of Your love and mercy. Allow your radiant presence to re-ignite the fire of Your Spirit within me, so that I may be Your Sacrament of love and mercy and all.